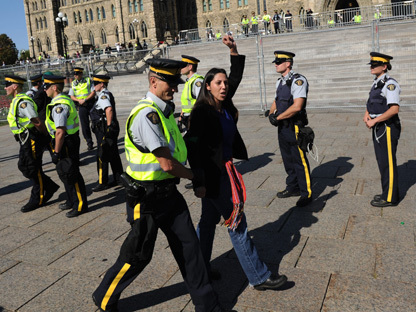 We couldn’t post any video of news reports on the Keystone XL protest in Ottawa because there is none. The CBC has not even posted a story in four days. So make that the non-existent video of the day. Update: Meanwhile, the Occupy Wall Street protest has spread to San Francisco and Boston, where twenty-four have been arrested. By accessing Canada’s crude oil the United State moves closer to its goal of reducing reliance on oil from the Middle East, a goal shared and expressed by every U.S. president since Dwight D. Eisenhower. This is so ludicrous that it qualifies as a lie. 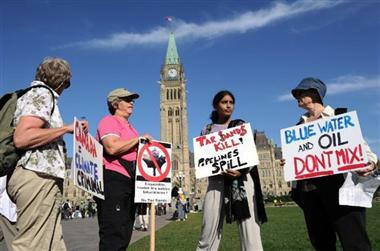 The tar sands produce less than 800,000 barrels of oil per day. The total American consumption of oil is 20,000,000 barrels a day. That is more than a 19,000,000 barrel shortfall. Per day. And that’s just American needs. The world’s daily consumption is around 80,000,000 barrels. The Keystone XL pipeline wraps up every kind of environmental devastation in one 1,700-mile-long disaster. At its source, in the tar sands of Alberta, the mining of this oil-rich bitumen has already destroyed vast swaths of boreal forest and native land – think mountaintop removal, but without the mountain. The biggest machines on earth scrape away the woods and dig down to the oily sand beneath – so far they’ve only got three percent of the oil, but they’ve already moved more soil than the Great Wall of China, the Suez Canal, the Aswan Dam and the Pyramid of Cheops combined. The new pipeline – the biggest hose into this reservoir – will increase the rate of extraction, and it will carry that oily sand over some of the most sensitive land on the continent, including the Ogallala aquifer, source of freshwater for the plains. A much smaller precursor pipeline spilled 14 times in the past year. Even if the oil manages to get safely to the refineries in Texas, it will take a series of local problems and turn them into a planetary one. Because those tar sands are the second-biggest pool of carbon on earth, after the oil fields of Saudi Arabia. Burning up Saudi Arabia is the biggest reason the Earth’s temperature has already risen one degree from pre-industrial levels, that epic flood and drought have become ubiquitous, and that the Arctic is melting away. Since we didn’t know about climate change when we started in on Saudi Arabia, you can’t really blame anyone. But if we do it a second time in Canada, we deserve what we get. If you do the calculations, explains James Hansen – the planet’s most important climate scientist, who was arrested at the White House about halfway through the two weeks of protest – opening up the tar sands to heavy exploitation would mean “it’s essentially game over” for the climate. Which is a sentence worth reading twice. Right now, the atmosphere holds 392 parts per million CO2, already dangerously above the 350 ppm scientists say is the maximum safe level. If you could somehow burn all the tar sands at once, which thank heaven you can’t, the atmospheric concentration would rise another 150 parts per million. 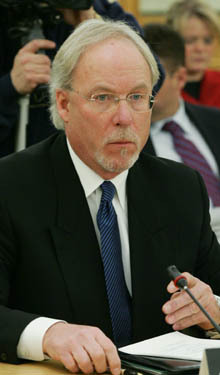 This entry was posted in Canada, Current Events on October 1, 2011 by Michael Happy.